ALL-TIME FAVORITE POST FROM 2008 RE-BLOGGED: When i went to Kuala Lumpur for the first time, i had the opportunity to visit one of KL's most astounding landmarks. Back on that day, i had a choice whether to travel to Genting Highlands or the Batu caves. I chose the latter because it was the perfect place to be blessed. I still have a month worth of travels ahead of me so i need all the prayers. 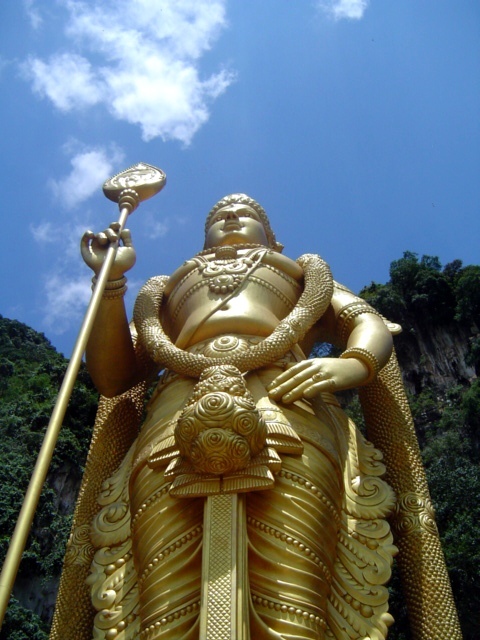 To get to Batu caves, one may ask the hostel/hotel concierge for directions, travel agencies along Bukit Bintang have information regarding bus schedules to and from the area, or you can do it your way which i did. After a few minutes of walking from my hostel, i arrived at the Batu Caves. 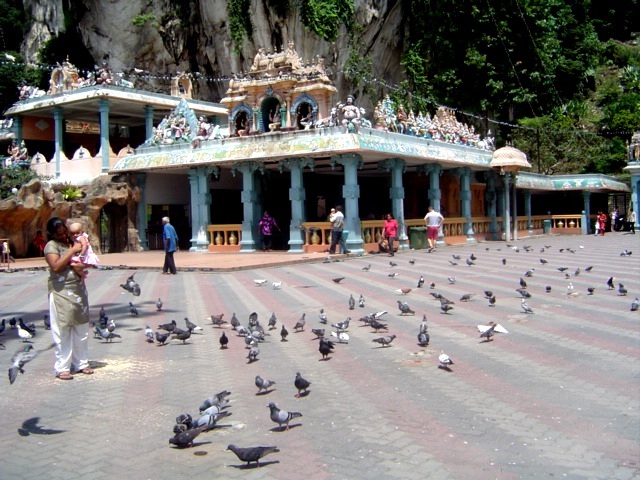 Batu Caves is 13 kilometers north of the capital city. 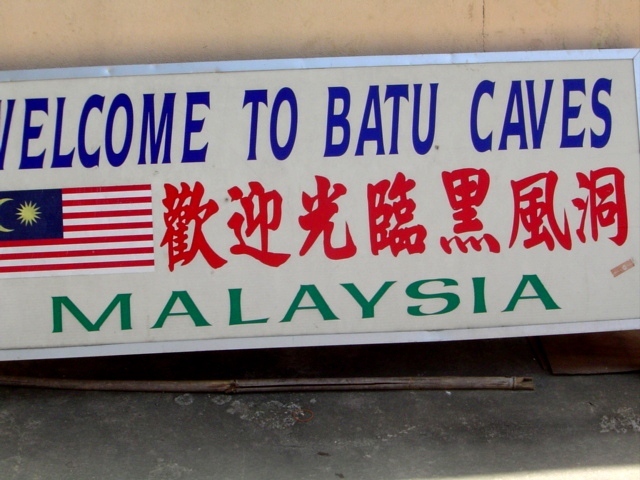 In order to get to Batu Caves, you must need to arrive at the bus station in Lebuh Pudu. Hop on the number 70 and 349 bus, which leaves every 30 minutes. You can also hire a taxi which will make your trip a whole lot easier or if you must, bus number 11 and 11d leave for the spot as well. There are also buses bound for Batu caves at the infamous Puduraya Bus Terminal. The route is open from 7AM till 9PM. You can also hire a taxi, agree on the price and relax on your way there. If you think going to the caves will be a breeze, it's not! It was noontime when i arrived, and its was scorching hot. I wore a black shirt, which was really not a good idea. Try to wear light clothing, preferably cotton. Carry with you a small backpack or a sling bag, and a good pair of sunglasses. Bring the essentials like a bottle of mineral water, some mint, and don't forget to charge your camera batteries because you will be surely taking so many photos. All of these are available at the peak, but mind you, it's going to be ridiculously expensive. 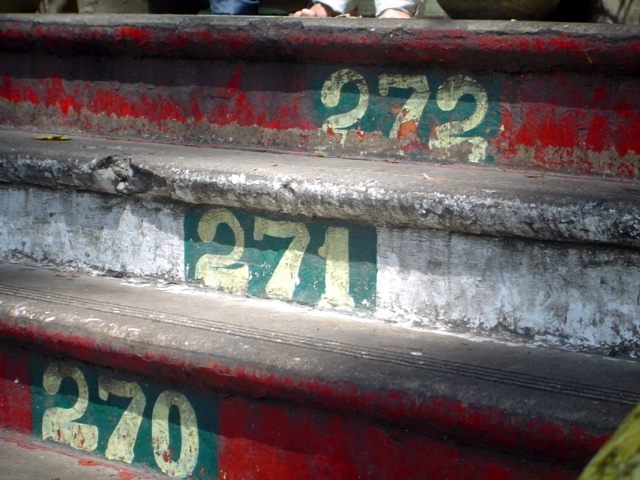 It's 272 steps to get to the entrance of the cave. And climbing up via steep, narrow steps is practically a challenge. 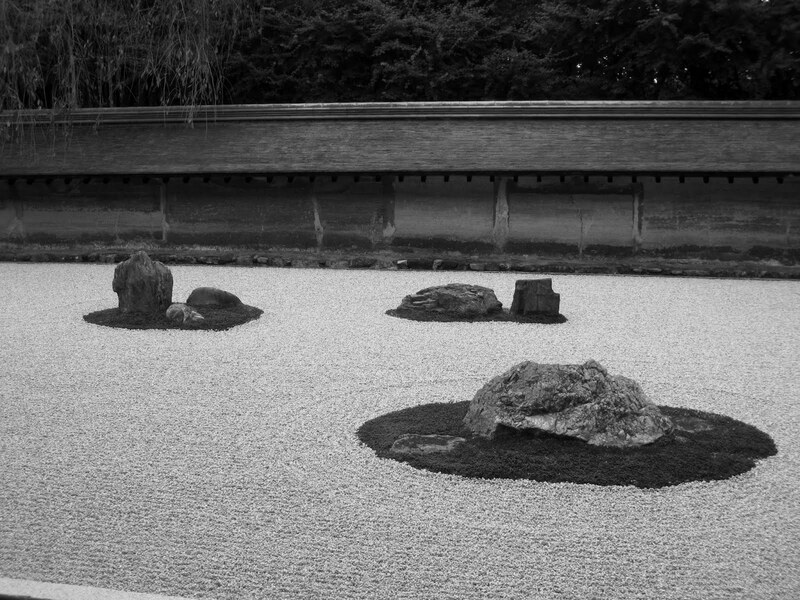 You can stop after a few hundred steps just like me, and like everyone else. 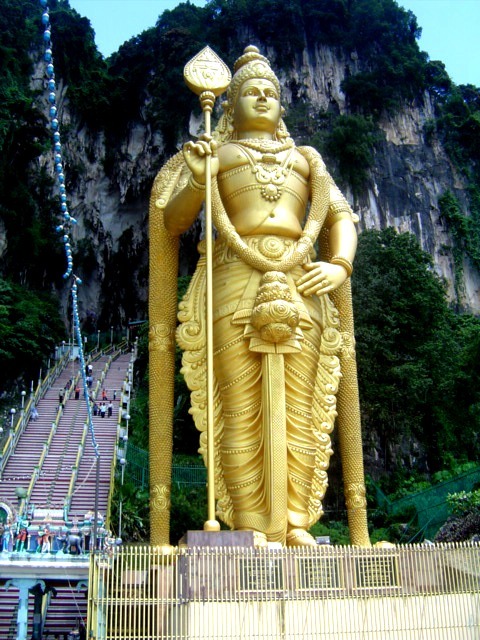 Batu Caves is 400 meters long and 100 meters high, so be prepared. Sleep early and avoid smoking. This sacred place for the Hindus is also home to long tailed-macaque monkeys. Even if peanuts and bananas are sold at the shops, don't even think about it! One funny but life-threatening experience i had was once i reached the caves. I bought a coca cola to quench the thirst. As i was drinking, i suddenly noticed the monkey slowly approaching me. I knew right there and then, they were going for my cola. With images of monkeys scratching my arms to rabbis and the movie Outbreak, i threw the can to their delight. I hurriedly went down after that. Gee! This is just my personal opinion but the experience could have been better if not for the cheeky stalls selling souvenirs and overpriced camera batteries. Moreover, it could have elevated the trip if it was the time of the Thaipusam festival, where about 800,000 devotees and visitors flock the Batu Caves to do penance and sacrifice. 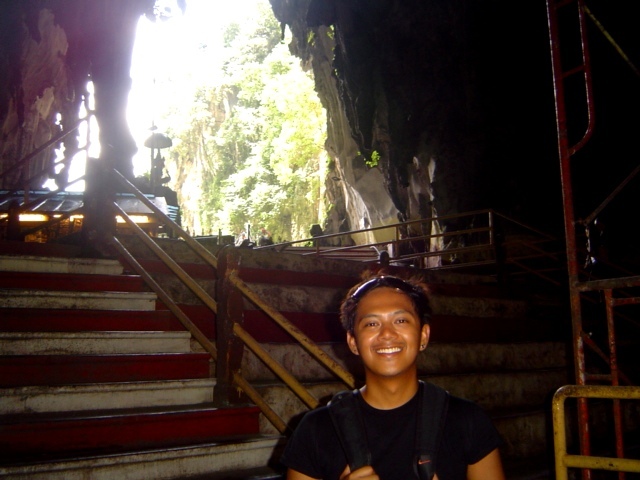 I visited Batu Cave last year...theres nothing to see inside the cave...mas maganda sa labas. @Eric i know right? Thank God someone else noticed it. There's nothing up there, the view from where you're looking up is astounding because of the statue but other than that 272 steps ain't worth it. Eric, just curious... how do you find Kuala Lumpur?